Experiential image retrieval systems aim to provide the user with a natural and intuitive search experience. The goal is to empower the user to navigate large collections based on his own needs and preferences, while simultaneously providing her with an accurate sense of what the database has to offer. In this project, a novel interface gives the user the opportunity to visually and interactively explore the feature space around relevant images and to focus the search on only those regions in feature space that are relevant. In addition, we give the user to opportunity to perform deep exploration, which facilitates transparent navigation to promising regions of feature space that would normally remain unreachable. In low-level feature space images of interest can be spread out over multiple areas. 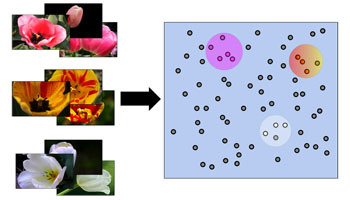 For example in a feature space built up on color features, it is likely that images of differently colored tulips can be found in several parts of the space, see Figure 1. Such a search can be performed using multiple query points, but exploring the feature space around each query point is often a slow process. Figure 1. Depending on the features used, images of the same category may end up in several parts of feature space. Most interfaces only present a limited number of images to the user, putting a heavy burden on the user, because navigating the space around each query point requires many iterations of feedback. To reduce user effort and allow efficient refinement of the relevant search space, we propose a novel technique whereby the user can visually and interactively explore the feature space around an image and transparently navigate from one area in feature space to another to discover more relevant images. In retrieval systems based on relevance feedback, the user indicates his preferences regarding the presented results by selecting images as positive and negative examples. Subsequently, these feedback samples determine a relevance ranking on the image collection, and new images are presented to the user for the next round of feedback. In contrast, we propose to integrate feedback selection with a visualization mechanism that allows us to quickly explore the local feature space surrounding an example image. The interaction provides a better sense of the local structure of the database, and allows us to center on examples that best capture the qualities desired by the user. This approach, which we call deep exploration, entails the following process. At the start of an exploration interaction only the selected image is displayed. Then, by adjusting the exploration front, more and more of its nearest neighbors are shown, see Figure 2. Figure 2. Adjusting the exploration front. The actual deep exploration occurs when the user encounters an image of interest in the exploration range, and decides to transfer the focus to this image to continue the exploration with the new image, see Figure 3. This provides the user the opportunity to easily reach other areas in feature space. This can be done as many times as the user wants, jumping from one area in feature space to another. This technique is particularly useful when the search seems to be 'stuck' and cannot improve with the current collection of relevant images. Also, using deep exploration to move from an isolated relevant image to a more densely populated relevant area has direct benefits for the feedback analysis, allowing our feature selection and weighting approach to perform better with the additional data. When the user decides to treat a centered image as a positive or negative example, then all images within the exploration front will also be treated as such. The retrieval system collects all feedback and performs relevance feedback analysis to determine the most relevant images, which are the ones that best match the user's interests, and most informative images, which are the ones that allow the user to easily continue exploring the feature space. The collection of explored feedback images provides us with a convenient setup for local feature selection. In particular, it allows us to take into account prior feature density by giving higher weight to feature regions where images cluster unexpectedly. This is desirable given that for features to which the user is indifferent, clustering will naturally occur at the feature regions of high prior density. In our method, the influence of the latter kind of features is suppressed. Our approach is to estimate the prior feature value density corresponding to the local clustering of examples at the image under study and set the distance function weights accordingly. To illustrate, in the left figure of Figure 4 we can see an image of a sunset that is explored with default feature weights. After several iterations of feedback the feature weights have changed and when the image is re-explored, as is shown in the right figure, its nearest neighbors are more relevant than they were before. Figure 4. Automatic feature weighting results in more relevant nearest neighbors. For more information and experimental results, take a look at the MM2009 paper in the publications section. Earlier work was published and presented at BNAIC2009 and ISPA2009.